Some of the additions need a little more work, but FL Studio remains a uniquely enticing proposition for electronic musos. Flexible and easy to use. Great piano roll, Playlist, and mixer. Solid workflow improvements. Lifetime free updates. Pattern blocks on the way out. Not as useful for live work as it could be. Patcher unstable with third-party VSTs. Drum sounds could be better. With version 10, Image-Line are giving pattern blocks the heave-ho. Here we're building a custom multiband distortion effect using a different plug-in for each band. In the playlist, right-click the pattern selector and the Project Picker appears. Mouse over the clips to hear your patterns, then drag and drop onto the playlist. 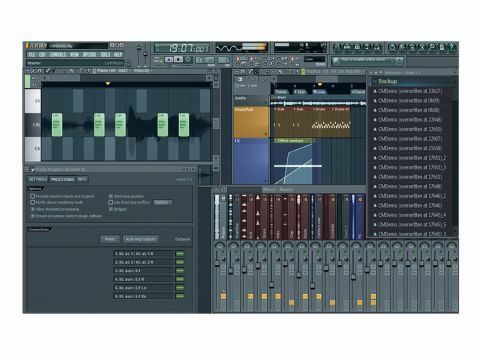 Many computer musicians hold FL Studio dear as their first - and sometimes only - musical love. If you're not yet familiar with it, here's a crash course: it's a DAW that enables you to record/edit audio, edit MIDI in a piano roll or step sequencer, work with patterns, arrange them into songs and mix the lot down. "We hope that more live features are on Image-Line's to-do list." There's an extensive array of instruments and effects included, the app is stable and solid, and the interface is straightforward and clean. It has a bit of a false reputation as being "for beginners", but there are certainly professionals who use it because it's easy to use. Owing to its emphasis on MIDI and sample-based production, it's best suited to electronic musicians. Sure, it can handle a few audio tracks, but if you're looking to record a band, you should look elsewhere. We're reviewing the top-of-the-line Signature Bundle here, although there are packages to suit all pockets. The last 'proper' release of FL Studio 9 was v9.1, and releases since then have been public betas leading up to v10. So, we'll be looking at everything added since v9.1. But first, we need to look at what's been taken away. FL Studio's long-standing pattern blocks are now being phased out. On launching it they're absent, and while they can be re-enabled in the settings, a message warns that pattern blocks are obsolete and won't be in future versions. In a way, this is good news because the developers can improve the new clips Playlist system without having to accommodate and maintain the old system of pattern blocks. The thing is, some users prefer pattern blocks because they've been using them for so long, and a serious concern with live show performers is the future of Live Mode. Using pattern blocks with Live Mode is currently the only way to launch patterns on-the-fly. The new playlist marker types, while handy for arranging, and potentially useful for live performance, are not yet satisfying substitutes for the old Live Mode. On the bright side, since these new marker types (and the new ZGameEditor Visualizer plug-in) are being advertised as great for live performance, this suggests that Image-Line consider live features to be a central part of FL Studio. We do hope this means that more live features are on their to-do list. On to the new stuff, then. The piano roll, Playlist (ie, arrangement/project page) and mixer are fundamental to any DAW, and this update sees many GUI tweaks and workflow enhancements in these key areas. Check out the History section on the Image-Line website for a full rundown. FL Studio users have long appreciated the 'ghost notes' feature that allows you to see the notes of multiple instruments on the same piano roll, and now you can edit ghost notes directly by double-right-clicking them. Anyone who programs drums in the piano roll should be rejoicing, because this essentially lets you work with multiple drum parts in one editor, even if they all come from different plug-ins. The Playlist has received additions to its multiple timeline marker types, with pause, loop and skip markers being handy for testing out arrangement ideas. And there are lots of smaller yet no less helpful changes, such as the improved zoom-scroll bars and the ability to view tracks at differing vertical heights. The all-new Project Picker is neat and effective, while the mixer now has a lovely wide-view option that looks great and makes it a pleasure to work with. There's now automatic plug-in latency compensation (but still no proper track freeze, alas). Refer to the FL Studio 10 website for the full rundown of new features. FL Studio has an extensive line-up of plug-ins, and some of our most oft-used of the existing lot are Maximus (a multiband compressor/limiter), Parametric EQ 2 (sonically transparent and visually stunning), SliceX (a wave editor, slicer and player all in one) and the stonking Sytrus synth. We've also become big fans of Fruity Convolver, a convolution plug-in that's great for reverb and sound design, and the physical-modelling drum synth Drumpad - both were added since our FL Studio 9 review with the v9.1 update. Slightly misleading is that demo versions of the Newtone and Pitcher plug-ins are claimed as new features and even appear in Image-Line's promo video. However, the full versions aren't included with any version of FL Studio and are in fact separate add-ons. As for included new plug-ins, there's Patcher and ZGameEditor Visualizer, which creates trippy demoscene-esque visuals based on audio input. Parameters can be automated to make the visuals fit your tune and you can render the lot out to video. There are already some impressive user-created videos on YouTube that showcase the potential of this intriguing device. One of the best new additions in FL Studio 10 is the Patcher plug-in. This is a modular chaining environment that enables you to load instruments and effects into it and freely connect them in all manner of configurations. Crazy chains are easily achieved since you can have the audio flow into separate branches that converge and split multiple times. You could make a custom multiband effect by branching an audio source into multiple EQs - one for high frequencies, one for mids and one for lows - then sending the signal from each EQ to its own effect plug-in. In our tests, Patcher became very buggy when we were working with third-party VSTs. For example, we experienced graphical glitches when trying to turn the knobs; we had FL Studio crash completely, plus one graphical freak-out; and linking knobs didn't always work. It also turned out that FL's Sampler and 3xOsc aren't available to load into the Patcher. Hopefully at least the graphical and stability issues will be worked out in future updates, but for the moment you'd be safer sticking with recent FL Studio plug-ins only when weaving your audio magic, or waiting until the Patcher gets, well, patched. So does FL Studio have everything you need? Not quite. There aren't many pro-sounding drum samples in there ready to go without some work - whether you're producing electronic music or otherwise, a solid third-party drum library would be a wise investment. On the instruments front, there are lots of synths, but many are outdated (eg, SimSynth, FL Keys); and 'real' instruments aren't well catered for at all, so you'd probably need to invest in a few plug-ins and sample libraries in that area too. Such omissions aren't a deal-breaker, though, especially bearing in mind Image-Line's 'free updates for life' policy (which applies only to the download version). Most DAW developers have you pay to upgrade to a new 'integer' version, but FL users always get theirs for free, so you could think of this as saving you money that could be put towards plug-ins, samples or anything else you might need. If you're a computer music newcomer, we heartily recommend FL Studio - trying the demo is well worth your time. And if you're an existing user, then why waste your time reading this? Download the update and get on with it!